In 1974, Franco Poli started is career as a professional designer, between Florence, Venice and Verona. Characterized by a great curiosity he has brought his talented personality through three decades of Italian design. 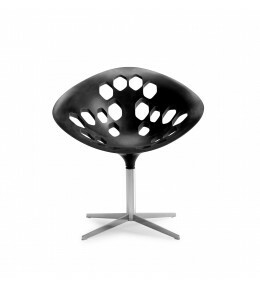 Notable for his great designs, Poli has collaborated with several manufacturers (especially furniture manufacturers). Franco Poli has used his restless personality to blend theory, attractiveness and technical details in order to create long lasting products, which have been characterized by an unmistakable Italian design. Since 1998 he lives and works in Verona. Exagon Lounge Chair is a great solution for breakout or reception areas within the office environment.